While there are millions of people managing food allergies around the world, you can count the number of recommended treatments and therapies on one hand. Innovation around food allergies has been stagnant for years, but recently, a number of startups have emerged that offer allergy sufferers hope that avoidance won't be the only solution for long. From Silicon Valley to the University of Chicago, scientists and entrepreneurs - some of whom live with severe food allergies themselves - there are exciting new innovations that could simplify and save lives. For decades, EpiPen has dominated the auto-injector market, but many patients are looking for more options. Learn about potential alternatives that promise affordability, portability, and ease of use. This Boston startup is working to develop an epinephrine auto-injector that’s 40 percent smaller than current auto-injectors, simple to use, and has a long shelf life. This new auto-injector stores the drug in a temp-stable, dry form until it’s needed. Upon activation, the device rapidly and automatically mixes the dry drug to form a solution when the cap is removed. According to Windgap’s CEO, the improved temperature stability means that if their epinephrine auto-injector is left in a hot car on a sunny day, it won’t have to be thrown away. Windgap’s product will be submitted for FDA review in 2018. Researchers in Florida are working to develop a dissolvable pill that, when placed under the tongue, will reportedly deliver epinephrine as effectively as an auto-injector. While this product may be more portable, affordable and easier to use than an injector, it has yet to be tested on patients experiencing anaphylactic shock. Currently, they are still awaiting FDA approval to begin testing and trials. Since the 2015 recall of AUVI-Q, Kaleo took back the license to manufacture the popular auto-injector and has invested in new systems to ensure "accurate, reliable and consistent delivery" from the product. In February 2017, AUVI-Q returned to the market with an unprecedented affordability plan. AUVI-Q is the same portable size and still features the unique voice prompt system that offers users step-by-step instructions. For more information, check out Spokin's AUVI-FAQ and learn How To Get AUVI-Q For $O. With Inspired Start food pouches, families can introduce eight common allergens to their little ones just like any other solid food. Each pouch contains an organic fruit puree and a small amount of one potentially allergenic protein. 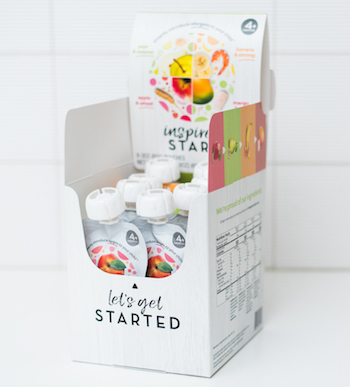 This simple early allergen introduction product was created with the help of leading allergists, nutritionists, and the "Inspired Start Board of Moms." Plus, each delicious recipe has been taste-test approved by plenty of babies! Inspired Start is now available on their website and Amazon Prime. This health and wellness company hopes to put a stop to food allergies before they start. CEO Ashley Dombkowski, Ph.D. and co-founder Dr. Kari Nadeau are uniquely qualified for the task. Ashley was the Chief Business Officer at 23andMe as well as an active investor and serial entrepreneur in the healthcare industry. Dr. Nadeau is a pediatrician and the director of the Sean N. Parker Center for Allergy Research at Stanford University and the woman behind the breakthrough oral immunotherapy (OIT) trials. Together, they have developed an easy way to introduce allergens into children’s lives at a very early age in the form of a daily mix-in powder. Read our in-depth interview with Ashley for more! Brilliant minds across the country are currently running tests and trials, hoping to someday improve the lives of allergy sufferers. Find out what’s on the horizon. Scientists at the University of Chicago are developing a drug, ClostraBio, to treat childhood food allergies through the gut. Led by Dr. Cathy Nagler, researchers are making breakthrough discoveries about the gut’s complex microbiome (made up of trillions of bacteria living inside all of us) and its ability to create a barrier that stops allergens from entering the bloodstream. While new medications are still a year or two from clinical trials, they’ve already identified a difference in the gut bacteria of babies who have cow’s milk allergies and infants who do not. Aimmune’s lead product candidate, AR101, seeks to safely and reliably protect peanut-allergic children and adults in cases of accidental exposure to peanut. People who receive this promising treatment will sprinkle gradually increasing amounts of AR101 on their food over a set amount of time, with the goal of increasing the amount of peanut protein an individual can tolerate. The FDA has already granted AR101 “Breakthrough Therapy Designation” and “Fast Track Designation” statuses, which may help expedite AR101’s availability to patients and allergy clinics throughout the United States. Aimmune is also reportedly working on similar treatments for other food allergies. Some day soon, immunotherapy may be as simple as brushing your teeth. Intrommune Therapeutics is striving to develop an oral mucosal immunotherapy (OMIT) product that delivers small extracts of common food allergens via a prescription toothpaste that is fully-functional for regular dental hygiene. This therapy is designed to become part of your everyday routine, and over an extended period of time, desensitize people to certain foods.